I’ve gone on about this elsewhere, but thought I should bring it up front and center here. This from Steve Keen’s latest. (It’s not very long. There are lots of pictures. It makes every kind of sense. Read the whole thing.) The blue line is publicly held debt — not including money the government owes itself (on the consolidated budget) for Social Security and Medicare. *† The red line is debt of 1. households and nonprofits, 2. nonfinancial businesses, and 3. financial businesses. Again, you hear all sorts of hyperventilating from the morality-based school of economics about households/consumers going on a debt-financed spending binge, especially in the 00s. And that definitely happened. With the financial industry begging them to borrow — almost literally throwing money at them — and telling them authoritatively that it’s free because house prices always go up, it’s not surprising. Humans will be humans; who’s gonna turn down money when the powers that be — who presumably know a lot more about finance than a high-school-educated homeowner working at a lumber mill — say it’s free? But that ignores the really massive runup: financial corporations’ debts. Starting at a little over 10% of GDP in 1970, they hit almost 80% by 2000, and when the crash hit they were over 120% of GDP — a 10x, order-of-magnitude increase over 40 years. The story explaining these pictures was told long ago — notably by Irving Fisher in 1933 (only after he had driven his Wall Street firm to ruin and lost everything, including his house, by clinging, Polyanna-like, to the kindergarten-ish Price-Is-Right! nostrums of classical economics). Minsky told it in cogent and convincing detail. • Banks (and shadow banks) make money by lending. Bankers have every incentive to increase their loan books, even by extending questionable loans, because bankers don’t personally bear the eventual, down-the-road losses from loan defaults — they’ve gotten their money already. • When banks run out of real, productive enterprises to lend to — enterprises that can pay back loans and interest from the production and sale of real goods that humans can consume — they start lending to speculators (gamblers) who are buying financial assets in hopes that their prices will rise. • That lending — extra money being pumped into the system — does indeed drive up the price of financial assets, far beyond the value of the real assets that (according to most economists you listen to) supposedly underpin those financial assets’ value. • Eventually people realize that the value of financial assets far exceeds the value of real assets — and far exceeds the capacity of the real economy to service the loans that drove up those financial asset prices. Prices of financial assets plummet, borrowers default because there just ain’t enough real income to service the loans, financial-asset prices plummet some more, all in a downward spiral — with all sorts of collateral damage to the real economy. There’s your (economy-wide) Ponzi scheme. Households and nonfinancial businesses definitely participate (the financial industry makes it almost irresistible not to), but it’s driven by the financial industry, and a huge proportion of the takings go to players in the financial industry. The rarity — inexplicable to me, at least — speaks even more loudly and eloquently than this blithely dismissive quotation does. When really smart people like Ben Bernanke constantly ignore an elegant, simple, even obvious explanation that’s been lying on the ground, ready to pick up, for at least 75 years, you gotta figure they’ve got some incentive — whether they’re conscious of it or not. That’s what I talked about the other day. Again, read Steve’s whole piece. And if you have any interest in economics and haven’t bought the new edition of his book yet, do. * Please don’t try to dismiss this by pointing to the net present value of SS/Medicare liabilities extending into the infinite future. 1. Including those intra-government debts doesn’t change this picture much at all. 2. It’s a completely separate discussion, about whether we choose to provide those services out of current GDP over future years and decades. 3. If charges by health-care providers were rising at the same rate as inflation, even that future cost would not be a terrible burden. 4. Social Security is actuarily solid on a cash-flow basis for decades, and beyond the foreseeable future (75 years+) if we simply Scrap The Cap on the payroll tax, requiring high earners to pay their full share. † I’m not clear whether he includes bonds held by the Fed — again, money the government owes itself, if you view Treasury and Fed as both being part of the government — which total a whopping $1.6 trillion or so, more than 10% of GDP, last I checked. I don’t actually know if Fed holdings are included in “debt held by the public.” (You gotta wonder whether the Fed counts as “the public.”) Little help, so I don’t have to go Google it up myself? No it doesn’t. It almost never is. To pay back government debt, you have to run a budget surplus, and while there may be modest surpluses from time to time, they don’t add up to more than a minuscule fraction of all the accumulated debt. But don’t take it from me, look at the record. The reader will recall that the Bank of England was created when a consortium of forty London and Edinburgh merchants — mostly already creditors to the crown — offered King William III a £1.2 million loan to help finance his war against France. To this day, this loan has never been paid back. It cannot be. If it ever were, the entire monetary system of Great Britain would cease to exist. That loan was issued 317 years ago — in 1694. Governments that issue their own money don’t have to pay off their debts. They actually can’t. In fact, they issue money — the money that’s necessary for a growing economy to operate — by deficit spending. Private borrowers (and non-sovereign-currency states like Greece and Alabama) do have to pay off their debts (or default). That’s why the level of private debt, not sovereign debt, is the big management problem — a problem that neoclassical economics has not tackled, does not even have the theoretical apparatus to tackle. The debt burden depends on the ratio of debt to GDP as well as the interest cost in servicing it. The way to reduce this burden is to have a combination of real economic growth, inflation and modest interest rates. If you want to show your solicitude for the well-being of future generations, demand macroeconomic policies that will boost demand and raise inflation a bit, consistent with continued low interest rates. Today’s creditors will hate you. But your grandchildren will love you. Update (thanks to Buffpilot for finding holes): A more precise explanation of why a sovereign-currency issuer might “have” to pay back their debt: if they have committed to redeem their money for something else. For instance Argentina (dollar-denominated debt) and whole host of others who were on a gold standard, had promised to give gold in return for their money. If they can’t or won’t do so, that’s a default on their promise. The U.S. and the U.K. (among others) do not face that situation. A couple of our gentle Bears have suggested that I repost this over here. Ask and ye shall receive. It’s a good complement to and demonstration of the point I tried to make in my last post. Their model is obviously telling them that whatever (non-)actions they’re taking at the moment will solve the problem. And their model is obviously, consistently, and wildly wrong — and always wrong in the same direction. Altering that model to accurately predict unemployment, of course, would require that they allow more inflation in order to address both of their mandates. And higher inflation utterly slams the real wealth of creditors. And the Fed is run by creditors. 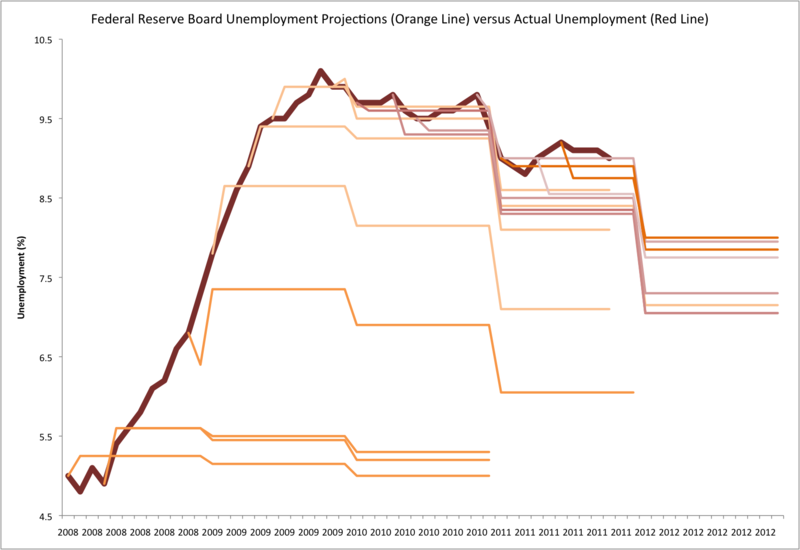 Comparing the Federal Reserve’s Reaction to the Financial Crisis Versus the Unemployment Crisis | Rortybomb. Increased inflation results in (in a sense, is) a wealth transfer from creditors to debtors. Debtors get to pay off their loans in less-valuable dollars — dollars that can’t buy as much real-world stuff, stuff that humans can consume, that they value. If you’re holding a hundred million dollars in bonds — you’ve lent out hundred million dollars — and bananas are going for a dollar apiece, an extra percent of inflation means that a year from now, you can only buy 99 million bananas. The people who borrowed the money from you get the other million bananas. If inflation stays up and the loan remains outstanding, they get another million bananas next year. You don’t. You can start to see why creditors might be inflation-averse. How big is this wealth-transfer effect? Here’s a quite conservative back-of-the-envelope calc. Figure that there are somewhere north of $50 trillion dollars in private “credit market instruments” out there in the U.S. as of Q3 2011 ($120 trillion in total liabilities). Do the math: 1% of $50 trillion is 500 billion dollars. One extra point of inflation transfers that much wealth — buying power — from creditors to debtors. Every year. This is probably an overstatement — many people/businesses are both creditors and debtors, so part of the transfer is from them to themselves. But still: let’s cut the number in half. An extra point of inflation transfers a quarter of a trillion dollars per year in buying power — real wealth — from creditors to debtors. And there are far fewer creditors than there are debtors. The effects of the transfer are concentrated on one side, diffused on the other. (See: Mancur Olson). The Fed is run by creditors. And I’ve heard it said that financial incentives matter. The Fed governors have a huge incentive to keep inflation low, and ignore the other side of their dual mandate: employment. We tend to talk in very big numbers these days, but a quarter of a trillion dollars a year seems like it’s still enough to get people’s attention. Is Big Government Inevitable? Desirable? Necessary? • Governments in all thriving, prosperous countries tax/spend 25–50% of those countries’ GDP (averaging around 40%). • Governments in non-prosperous countries — those that haven’t suffered a recent crash in the numerator/GDP — are all below that range. There is not a single thriving, prosperous country that does not tax at these levels, or engage in massive quantities of redistribution. Not one. If policies eschewing such redistribution are so economically efficient — as claimed by libertarians/conservatives/Republicans/neoclassical economists — one would expect at least one country to have emerged that eschews those policies, and to see that country surge ahead of all the rest. It hasn’t happened. Not once. Redistribution is necessary for a prosperous country to emerge and thrive. It is at least a necessary (though of course not necessarily sufficient) cause of that prosperity. 1. Government services are “normal goods” — as people get more prosperous, they want more of them. Giving people what they want is not a bad thing. #2 is, I think, the the argument that libertarians would make to explain the correlation between government size and prosperity. I don’t know how to adjudicate in any definitive way between these two conclusions, or between [one of them] and the redistribution-“causes”-prosperity conclusion. Given some correlation (necessary to even assert causation), the only way to convincingly demonstrate causation is to tell a coherent and convincing story about the process by which the causation happens. That’s what I did in my first Angry Bear post (well, you can judge for yourself how convincing it is). Larger government and a significant dose of redistribution are necessary for a prosperous, modern country to emerge and thrive. In my first post here as an official Bear, I want to start by thanking Dan Crawford and the rest of the Clan of the Angry Bear for inviting me to join the party. I’ve been a regular lurker and occasional commenter for years, and have learned a huge amount from the experts here. I’m looking forward to contributing more regularly. For my inaugural post, I’m going to break with my tradition and rather than inflicting data on you, I’m instead going to frame much of what I write in some big-picture ideology and theory. I think this thinking does much to explain what Mike Kimel in particular has made so clear here over many years (with occasional help from moi): that based on the long-term historical record, by pretty much any economic measure it’s progressive policies that deliver superior growth, prosperity, fiscal responsibility, opportunity, individual liberty, and a vibrant, robust economy and society. How can that be? 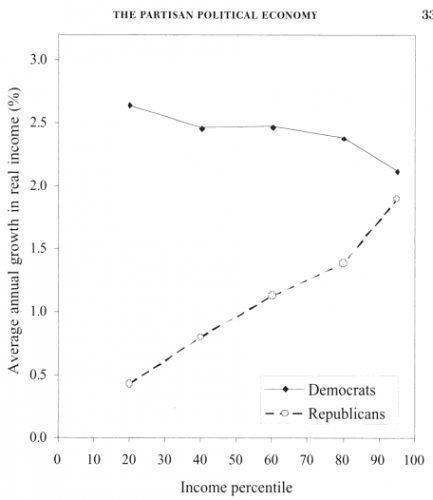 Aren’t Republicans “the party of growth”? I was pretty astounded at the time to find that the dominant meme just wasn’t true. Run the numbers various ways yourself, or do a review of the professional literature, and you get the same results: in prosperous countries, government size has basically no correlation with long-term economic growth (even though government sizes vary hugely — from well under 30% of GDP up to 50%+). Go figger. And that means that all the rhetoric, ideology, and theory supporting that meme has a problem. The more I thought about it, the more I realized that it was in fact wrong by a 180 degrees. Republican economic policies are widely perceived (especially by Republicans) as being pro-growth and pro-prosperity, even though All. The. Evidence. Demonstrates. The. Opposite. Even the rich get richer under Democrats (except for the very rich) — though not at the expense of the poor and the middle class. Progressives deliver more prosperity. They deliver it to more people. And they do it without busting the budget. How do they achieve all that? Through the miracles of economic efficiency — policies that make the markets actually work — and work better — for the greater prosperity of all. Wisdom of the Crowds. Democrats’ dispersed government spending — education, health care, infrastructure, and social support — puts money (hence power) in the hands of individuals, instead of delivering concentrated streams to big entities like finance, defense, and business. Those individuals’ free choices on where to spend the money allocate resources where they’re needed — to truly productive industries that deliver goods people actually want. Preventing Government “Capture.” Money that goes to millions of individuals is much less subject to “capture” by powerful players, so it is much less likely to be used to then “capture” government via political donations, sweetheart deals, and crony capitalism. Those bogeyman “welfare queens” don’t have much power or presence on K Street. The Wall Street and Defense Welfare Queens quite decidedly, do. Economic Stability. The social support programs put in place during and since the New Deal serve as automatic stabilizers for the economy, providing the kind of anticyclical fiscal policy that legislators and monetary authorities cannot — in their infinite discretion — be relied upon to deliver. Just as volatility trashes the returns on your investment portfolio, wild swings in the economy trash collective prosperity and the spectacular potential of compounding growth. Labor Market Flexibility. When people feel confident that they and their families won’t end up on the streets — they know that their children will have health care, education, a measure of economic security, and a decent safety net if the worst happens — they feel free to move to a different job that better fits their talents — better allocating labor resources. “Labor market flexibility” often suggests the freedom (of employers) to hire and fire, but the freedom of hundreds of millions of employees is far more profound, economically. Freedom to Innovate. Individuals who are standing on the social springboard that Democratic policies provide — who have that stable platform beneath them — have the economic freedom and security to strike out on their own and develop the kind of innovative, entrepreneurial ventures that are the true engine of long-term growth and prosperity (and personal freedom and satisfaction) — without worrying that their children will suffer terribly if the risk goes wrong. Give twenty, forty, or a hundred million more Americans a place to stand, and they’ll move the world. Profitable Investments in Long-Term Growth. From education to infrastructure to scientific research, Democratic priorities deliver money to projects that the private market don’t support on their own, and that have been demonstrated to pay off many times over in widespread public prosperity. Labor and Trade Efficiencies. The social support programs that Democrats champion — if they truly provide an adequate level of support — give policy makers much more freedom to put in place what are otherwise draconian, but efficient, trade and labor policies. If everyone who works is guaranteed a decent income by a program like the Earned Income Tax Credit, we have less need for the economically constricting effects often associated with unions and protectionism. Power to the Producers. The dispersal of income and wealth under Democratic policies provides the widespread demand (read: sales) that producers need to succeed, to expand, and to take risks on innovative new endeavors. (There aren’t many rich people, so they can’t buy very many iPads.) Rather than assuming that government knows best and giving money directly to businesses and banks, Democratic policies trust the markets — the people — to direct that money to the most productive producers. These aren’t actually “the” nine reasons — there are many more (I haven’t even mentioned smart, sensible regulation) — but they’re a great starting point for the kind of thinking that needs to be repeated over and over, endlessly, for decades (a la the Republicans’ incredibly effective long-term brainwashing campaign following the Powell memo), to bring about the change our country needs to thrive in the 21st century. Progressives are the party of prosperity, of individual opportunity, and of economic freedom. The historical and comparative evidence shows it in spades, and there’s very coherent and convincing theory to explain why. That’s a lot of what I’ll be talking about here at the Bear. I’m excited to hear your thoughts.